Such joy, but hate to hear it was short-lived! What a great portrait! They do look so happy. OH MY GOSH, I love this picture!! I could eat your kids...like because they are cute..not in a weird way:). Love the soft feel to the edit. Great job! Cute Cute. I love this picture! Awww. . .how could that smiling face ever go into melt down mode? This picture is really cute! Sweet picture! Never would have guessed a meltdown quickly followed! gorgeous.. simply gorgeous! all dressed for husker day! That's why you have shoot a lot and shoot fast - things can turn quickly in Toddler World! A fabulous shot! Great shot! 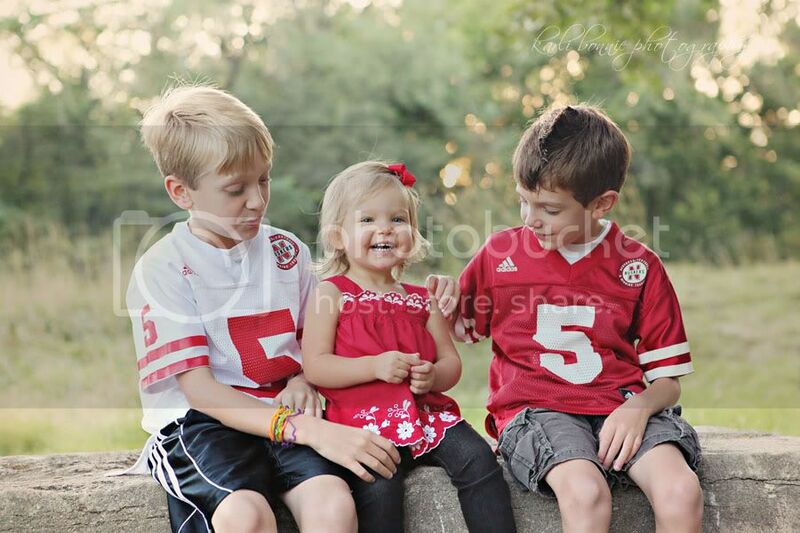 Looks like the boys adore her, but also love to aggravate her. Capturing the pre-meltdown moment: priceless. Meltdown?? What meltdown? Your kids are to happy and perfect to have meltdowns. Sweet picture! Go Huskers! (even though I'm an Aggie!) :) Have a great weekend! Karli I want to say one thing about this adorable picture - frame it! :) have a great day! Wow - Sweet children. Great picture.